You might remember, faithful reader, that Little Girl's nursery was done in flamingoes. So Momma has had a penchant for flamingoes ever since. So what better to do a casual birthday dress as well. Why not? 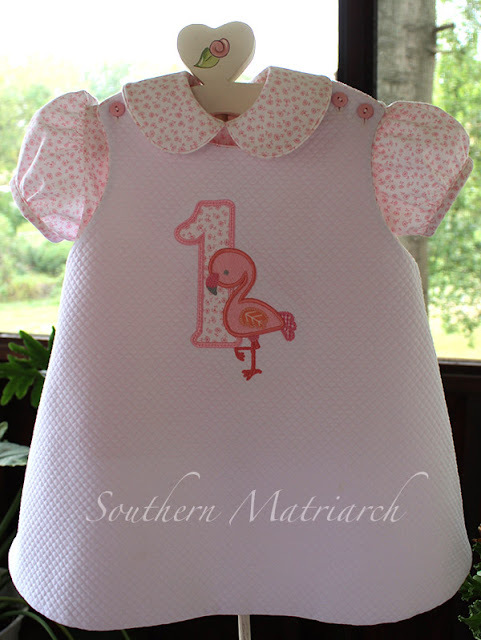 So I found this cute baby flamingo at Just Peachy The number appliqué is from DigiStitches. If you have been a reader for very long you should be able to recognize the pattern right off. 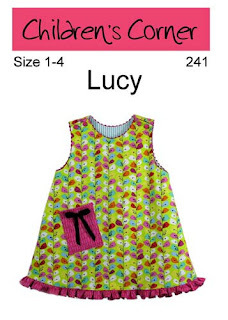 A favorite, Children's Corner Lucy. I have lost count of the number of these I have made. 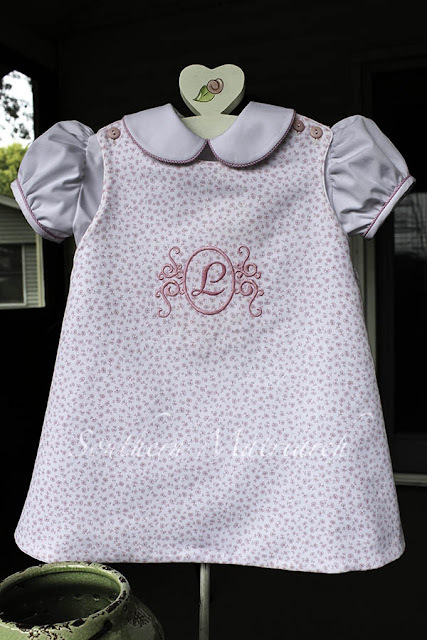 Fabric is Dakota Pique from Spechler Vogel. A dream to sew and care for. Poly/cotton. And why make it just one dress? I made it reversible. This side is monogrammed and made from an Heirloom Imports (sadly no longer in business) pique. 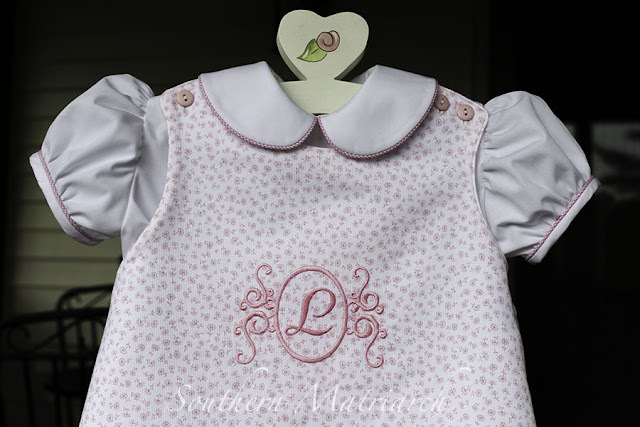 I can not remember where the monogram came from. 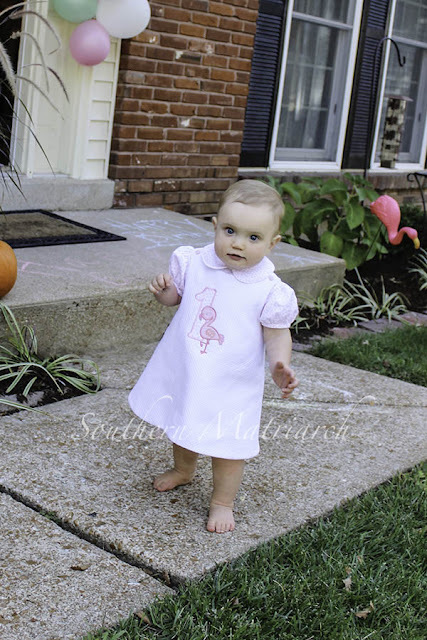 Both this sweet white broadcloth blouse and the one from the matching pique under the flamingo side, are both an out of print pattern by Children's Corner called "Meg". It comes up for sale on Etsy and eBay pretty often. It is definitely a keeper. As a matter of fact LG needs more of them now. It all makes it worth it when you see it on this sweet thing. By this time in the party, the bow was gone, the party dress had been annihilated and the shoes had been ditched. She has now turned into a "NO!" screaming 18 month old. Momma threatens to sell her to the gypsies. I just need to send her this photo to remind her what a sweet baby girl she is. When my now 37 year old daughter was little and she did something naughty she would say "NO GYPSIES"!!!! I thought I was the only one who used that expression!! Really enjoy seeing your lovely work, Martha, and those darling littles. Too funny. And thank you. Adore seeing this, and that sweet girl, again! If the gypsies arrived, I bet Momma might have a change of heart. :) I don't know, but of course once they are bathed and sleepy all is right with the world.